Kitchen renovations add a lot of value to your home. In order to maximize your return on investment and get the most out your renovation, however, planning is absolutely essential. In fact, the planning stage should take more time than the actual construction itself! With that in mind, here are five tips when it comes to planning a kitchen renovation to help you get the most out of your kitchen renovation services. 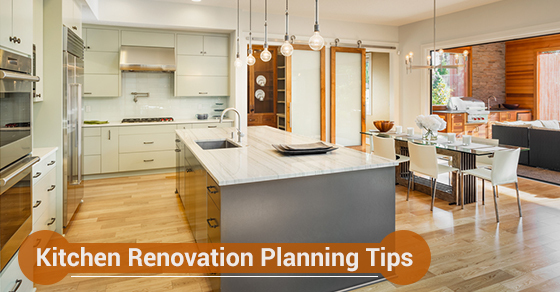 Sure, you want your remodel to make your kitchen look more beautiful. But also consider how you use your kitchen or at least how you, ideally, want to use your kitchen. Do you like to use your kitchen to entertain? Do you use cooking as a means to unwind at the the end of the day? This will help you to stay on track. Also consider the purpose of the renovation in the first place. Do you need more storage space? What are the most important features of your kitchen? All of these questions will not only ensure that you get the most out of your renovation, but they are also useful for budgeting purposes. One common mistake that many homeowners make when it comes to kitchen renovations has to do with measurements. For example, they purchase a large refrigerator but then don’t take into account that it won’t fit through the kitchen doorway. To avoid similar problems, write down all of your kitchen’s measurements, from the doorway to the walkways to the counters. Kitchens should be not only beautiful, but well-designed and easy to navigate. Keep in mind that the busiest areas of the kitchen, including the sink, the stove and the refrigerator, should be situated with efficiency in mind. Ideally, the distance between these three elements should form an equilateral triangle. Here are few other example when it comes to ergonomics and functionality. Consider drawers or pull-out shelves in your bottom cabinets or a wall oven instead of a traditional one. If you are ordering new appliances for your kitchen, be sure to choose them before anything else. It is much easier to choose design elements like your countertops that go with your appliances than having to try to choose appliances that go with your countertops, etc. To prevent any unnecessary delays due to back orders, choose fixtures and materials before construction.